The Way Huge Pork & Pickle is the first ever Bass pedal designed by Way Huge and it features both an overdrive and fuzz circuit inside. You may recognize the name from some of the famous guitar-based Way huge effects, the Pork Loin overdrive and the Russian Pickle fuzz. Overall your sounds go from modified classic British preamp tones to pokey Russian fuzz sounds. You can choose between both circuits with the Pork & Pickle and handily, you can dial in your clean tone to the distorted signal so that you retain clarity, even when your tones are getting gnarly. The Clean blend allows you to dial in your clean tone with the distorted signal but you also have control of the EQ of your clean sound with the ‘Clean Tone’ knob. 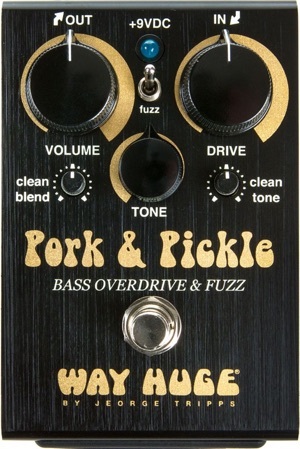 Way Huge® Pork & Pickle™ Bass Overdrive & Fuzz™ -The first ever bass pedal from Way Huge. This delectable dish combines the warm, soft-clipping tones of the Pork Loin Overdrive and the rich, fatty tones of the Russian Pickle Fuzz in a single package. This pedal has the Pork Loin Overdrive’s distinct sauced up clean channel from the Pork Loin Overdrive—a modified classic British style preamp—but it can be used with either mode. That means that, for the first time, you can run the Russian-Pickle Fuzz signal alongside that super sweet sounding clean channel. Stir in as much of the clean signal as you need with the Clean Blend control, and then use the Clean Tone control to season it to taste.